You are currently browsing the The Pet Product Guru blog archives for the day Friday, December 7th, 2012. Is your cat an audiophile? Cats get into everything! My cat Mollie was actually on the radio once, well not a big station. I ran a small station for my apartment complex that was based out of my own apartment. One day, I didn’t realize that I left the microphone on. I got in my car and turned on my station. The first thing I heard was loud meowing. It was Mollie sitting on top of the audio console meowing into the microphone! Her meows sounded better than the song that was playing at the time. Cats are also very curious. 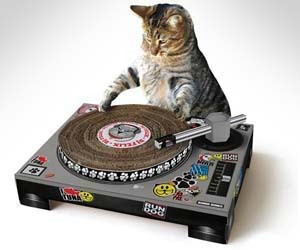 I saw a video on You Tube today where a cat acted like a DJ and began cueing up a record on a turntable. She then proceeded to jump up on top of the turntable and spin around with the record. If you own a cat, have your camera ready, you’ll be sure the capture some unforgettable moments! By the way my cats like my internet radio stations. Feel to listen to them anytime!